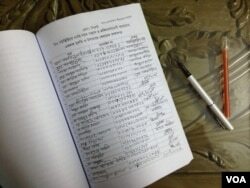 A leading Islamic group in Bangladesh has issued a fatwa condemning terrorism and militancy, including violent attacks on non-Muslims and secular writers and activists, as "Haraam," or forbidden and un-Islamic. The fatwa, or religious decree, was signed by more than 100,000 Islamic scholars, legal experts and clerics, and presented by Maulana Fariduddin Masoud, chairman of Bangladesh Jamiatul Ulama (BJU), a national body of Islamic scholars. In presenting the 62-page fatwa along with 30 volumes of books, each carrying over 3,300 signatures, Masoud said he began his campaign because terrorists were launching attacks in the name of Islam. This, he said, was leading to misunderstanding of the religion's tenets. “As they are indulging in the violent activities, they are terming them jihad and they say that they happily want to become martyrs through jihad. But, Islam stands against such violent terrorist activities. While Islam is based on peace, love and compassion, they are presenting it as a religion of the uncivilized and terrorist people,” Masoud told VOA. Since most people have an incorrect idea of jihad, the scholars who signed the fatwa sought to explain what jihad means in the Quranic context and how Islamist extremists are misleading both Muslims and non-Muslims on the issue, he said. “In our fatwa we have tried to explain that their activities cannot be called jihad because they are against the interest of humanity." At least half a dozen secular bloggers and one publisher were killed in the first wave of suspected Islamist attacks in Bangladesh, which began in 2013. However, in recent months, victims have included foreigners, Shi’ites, liberal Muslims and members of other religious minorities. At least 48 killings in Bangladesh over the last year and a half have been blamed on Islamists. The Islamic State claimed responsibility of more than half of the killings -- including this month’s hacking to death of a Hindu priest, a Hindu monastery worker and a Christian grocer. Al-Qaida claimed most of the other killings, according to the U.S.-based SITE Intelligence Group. Bangladesh's government insists that neither IS nor al-Qaida has a foothold in Bangladesh and that local militant groups are behind the killings. With attacks on minorities spiking in recent days, minority leaders have sought improved security from the government. Masoud said that the fatwa also addresses the issue of attacks on minorities. “Attacking and killing non-Muslims and vandalizing their religious places is completely un-Islamic. We have given that evidence in our fatwa. (The) Prophet Muhammad said, if a Muslim killed any non-Muslim, he would be denied entry to heaven,” Masoud said. According to Mufti Junud Uddin Maktum, the BJU's legal adviser, after drafting the fatwa, the national body took about five months to collect 101,524 endorsing signatures. “The legal opinions in the fatwa have been supported by quotations from the Quran and Sunnah, the two most trustworthy sources of Islamic law. It has elevated the authenticity of the fatwa. Furthermore, this fatwa also includes the signatures of around 10,000 female Islamic scholars. Their participation further increased its acceptability to all sections in the society,” Maktum told VOA. The fatwa is highly significant because more than 100,000 Islamic scholars and clerics signed it, said retired army Major General Abdur Rashid, the Executive Director of the Institute of Conflict, Law and Development Studies in Dhaka. The fatwa has also been welcomed by minority community leaders in Bangladesh. “This fatwa can help those who are involved in such militant activities understand that they have been misled. It can help bring a positive change in their life,” William Proloy Samadder, organizing secretary of the Bangladesh Christian Association, told VOA. He said the police in a country as heavily populated as Bangladesh, despite their best efforts, cannot provide security to every vulnerable individual. Samadder said that the fatwa can inspire ordinary Muslims to act against such militant activities.